If you are an NVIDIA SHIELD TV owner, news was released today that should be music to your ears. 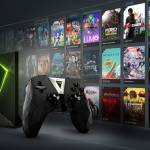 Since the original release of the SHIELD TV, a service called GeForce NOW has been available – and it actually runs extremely well so long as the bandwidth is available. But it also had a drawback in that the game library was NVIDIA’s own. This posed a problem for owners and PC gamers in particular. PC gaming has multiple content delivery platforms, such as Steam, UPlay, Battle.net, GOG.com and more. Even Twitch has now gotten into offering games through its own desktop app and Twitch Prime. For years, NVIDIA worked to solve this by offering a game code on one of those platforms when purchasing through theirs. Then at CES this year NVIDIA took a well-applauded step away from that solution and towards a better one. The PC and Mac beta offered access to several content libraries, including Steam, Uplay, and Battle.net. And as the beta took off the question remained – what was going to happen for SHIELD owners? The answer: SHIELD TV owners are getting an upgrade to the same beta offering as Mac and PC. The upgraded GeForce Now service allows users to play PC games they already own on the SHIELD TV. Previously, you could only play games that were offered by NVIDIA. It was a limited library and the games you already owned on Steam, Uplay, and Battle.net could not be played in the old GeForce NOW. Today’s announcement finally gets rid of that annoying limitation. The SHIELD TV now has the same model as the PC. Right now, there are 250 supported game titles, which can be found here. The service is in beta and free for now, but it will most likely not stay free forever.